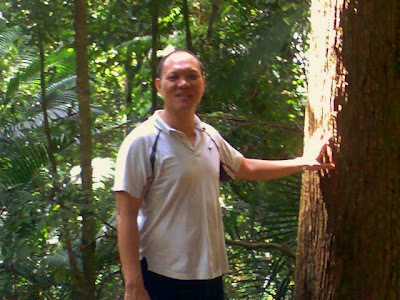 Thank god for the steep hilly areas:land much too steep for rubber or oil-palm plantations, or construction. One of the great things about my home-city is how near it is to waterfalls and jungle treks. 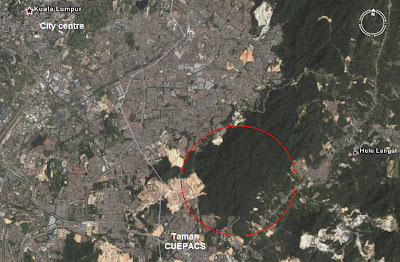 Taman Cuepacs is less than an hour from the city-centre. The housing development there date from the 1970's is rather non-descript: terrace-houses and more terrace houses with some terrace shop-houses for relief. Then there is an imposing high-rise development at a hill-top with some dreamy name like "Venice Hills" or something. But it is also at the foot of a scrap of hilly forest reserve. The jungle trail here is clearly marked. From a clearing next to a few rows of houses right next to the forest, you first climb up and down a small hill to a little stream. This is stage 1. 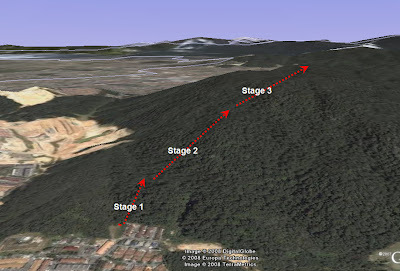 For Level 2, it gets steep for a good 30 to 45 minute climb. The rest is easier, but I've never gone on past Stage 3. 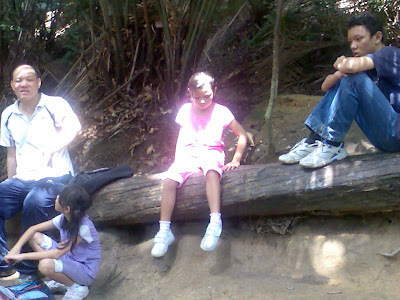 When I brought my family along for a trek it was a bit difficult for the two little girls, age 9 and 10. This is us resting after the steep ascent. Notice that we're not smiling. But the girls enjoyed it better when we we got back down to the little stream. Nature-loving city folks have been trekking through these forests for quite a while. Some of them had got together keeping the trails clean, placing signposts on them, put up simple toilets and changing room at a clearing where trekkers can park. But sometimes, citizen self-organization and people enjoying nature is too much for officialdom. 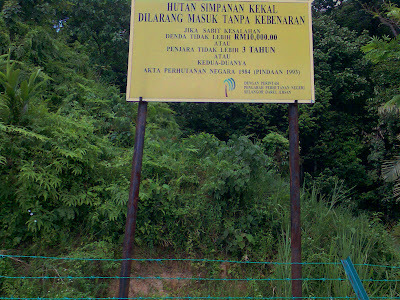 The State Forest Department has recently spent good tax-payers money to put up fence around where trekkers usually start their walks and put up a signboard threatening "3 years jail or RM10,000 (USD 3,000) fine, or both" for tresspassing! 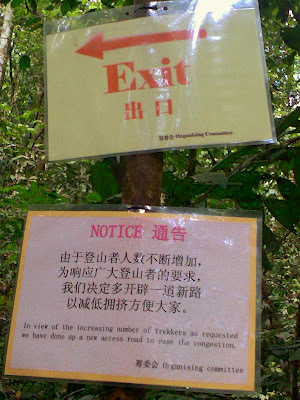 Am interested in 2 days trekking routes around Kuala Lumpur . Can you help me websites that would help me with the maps and other details.